For years, continuous miniaturization in the electronics and semiconductor industry has naturally forced even the device connectors to become ever tinier. This means probe cards for testing electronics must themselves be made smaller, too. A key component of probe cards are their guide plates. They contain a mechanically stable substrate with thousands of micro-bore-holes through which the probe card’s contact pins must be safely and precisely guided to facilitate subsequent reliable contact with the semiconductor device’s connectors. Substrates are made of ceramics. And it is exactly this material that is so challenging to process. Posalux’ laser processing machine specifically addresses these requirements. The integrated sub-system by SCANLAB, coupled with an ultra-short-pulse (USP) laser, enables processing of highly diverse materials such as metals, polymers and ceramics, without affecting them thermally. The scan solution provides five axes for defined laser beam guidance in the machine’s x,y,z coordinate axes and a simultaneous superimposed, adjustable angle of incidence (positive or negative). This makes it ideal for fabricating micro-bore-holes with high aspect ratios and freely definable geometries. And the intuitive user interface lets machine operators easily load a bore image, assign process parameters and scan the workpiece surface. Industry insiders are well aware of the imperative to create ever-smaller bore geometries. This makes it all the more impressive that Posalux’s precSYS infrared machine already fulfills application specifications previously thought only possible at green wavelengths. 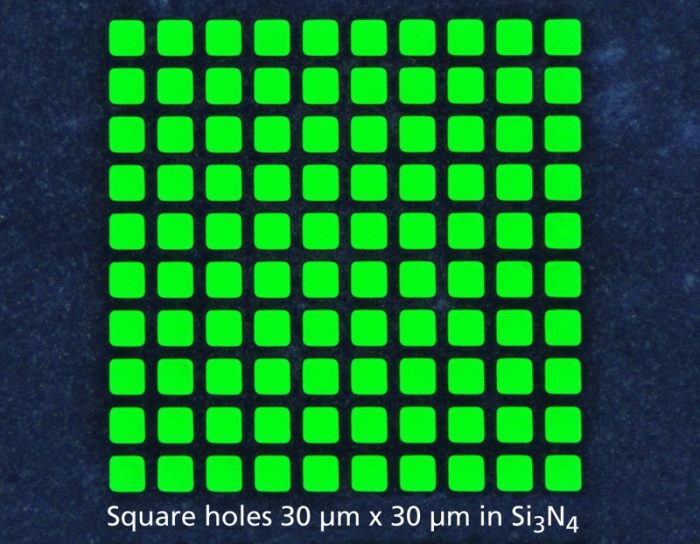 Here, customers’ usage demonstrates that even bore holes specified for 30 µm x 30 µm edge lengths, 300 µm material thickness and 10 µm separation are consistently achievable. In that application case, 46,000 bore holes were examined for positioning accuracy of ±2 µm, and corner radii smaller than 5 µm were reliably achieved. Thus, the user has available a robustly designed machine for processing any desired geometries in the µm range, as well as their exact localization to ±2 µm, across a maximum working area of 300 mm x 300 mm. “We’re pleased that our micromachining sub-system performs so well in applications. And we’ve received consistently positive feedback, not just from Posalux, but also from other integrators and users in additional industries. After these superb results, we increasingly look forward to the results of a precSYS ‘green variant’.” comments SCANLAB’s CEO Georg Hofner on the developments.